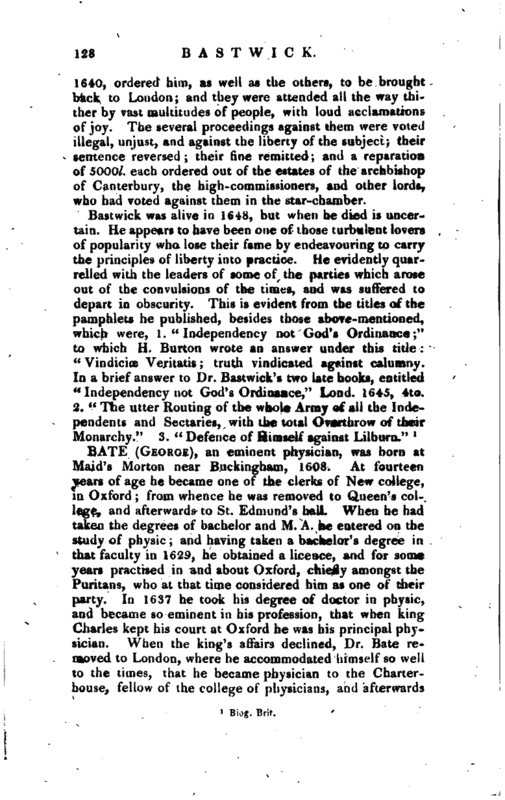 , an English physician of the last century, has acquired some celebrity, more from the punishment he suffered for writing, than for the merit of what he has written. He was born at Writtle in Essex, 1595, and studied at Emanuel college, Cambridge, but leaving the university without a degree, he travelled for nine years, and was made doctor of physic at Padua. He printed at Leyden, 1624, a small piece entitled “Elenchus Ileligionis Papisticse, in quo probatur neque Apostolicam, neque Catholic-am, imo neque Romanam esse,” 24mo. Afterwards, in England, he published “Flagellum Pontificis et Episcoporum latialium;” and though he declared, in the preface, that he intended nothing against such bishops as acknowledged their authority from kings and emperors; yet our English prelates imagining that some things in his book were levelled at them, he was cited before the high commission court, fined 1000l. and sentenced to be excommunicated, to be debarred the practice of physic, to have his book burnt, to pay costs of suit, and to remain in prison till he made a recantation. 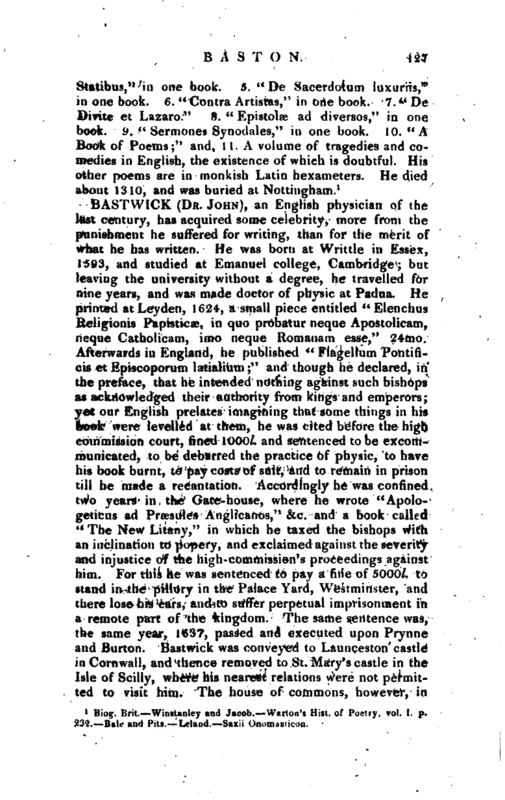 Accordingly he was confined two years in the Gate-house, where he wrote “Apologeticus ad Proesules Anglicanos,” &c. and a book called “The New Litany,” in which he taxed the bishops with an inclination to popery, and exclaimed against the severity and injustice of the high-commission’s proceedings against him. For this he was sentenced to pay a fine of 5000l. to stand in the pillory in the Palace Yard, Westminster, and there lose his ears, and to suffer perpetual imprisonment in a remote part of the kingdom. The same sentence was, the same year, 1637, passed and executed upon Prynne and Burton. Bastwick was conveyed to Launceston castle in Cornwall, and thence removed to St. Mary’s castle in the Isle of Scilly, where his nearest relations were not permitted to visit him. The house of commons, however, in | 1640, ordered him, as well as the others, to be brought back to London; and they were attended all the way thither by vast multitudes of people, with loud acclamations of joy. The several proceedings against them were voted illegal, unjust, and against the liberty of the subject; their sentence reversed; their fine remitted; and a reparation of 5000l. each ordered out of the estates of the archbishop of Canterbury, the high-commissioners, and other lords, who had voted against them in the star-chamber.